I was running an National Indoor Achievement Scheme Induction course today over at a climbing wall in Shropshire. There were 10 people on the course from different part of the country but who all worked for the same company. The aim of the course is to introduce instructors to NICAS and to inform them of the in's and out's of the syllabus, standard, admin involved in running the scheme at their climbing walls. The group were very enthusiastic and keen to get involved - we also had a good laugh. I've been travelling about the country recently carrying out assessments on climbing walls, abseil towers and ropes courses. A big well done to all those who passed various assessments particularly on the zip wire assessment last Wednesday when the weather was exceptionally bad with strong winds and torrential rain. Day two of the Single Pitch training course started very wet and cold with snow down to quite a low level on the hills but I trusted the weather forecast and stuck to plan A. After another quick chat and a brew at Petes Eats we went down the valley to Fachen to have a bit of a tour of the single pitch crags in the area so that the rock could dry out a bit. We looked at bouldering and group management at Lion Rock then Lone Tree crag before basing ourselves at Spotty Crag for the day. The weather turned out to be fantastic and the day was very successful with subjects such as belaying, bottom roping, top roping, personal and group abseiling and problem solving being covered during the day. For more photos of the weekend click here. SPA Training course. Day 1. I was straight into running an SPA training course today after a busy ML training during the week. 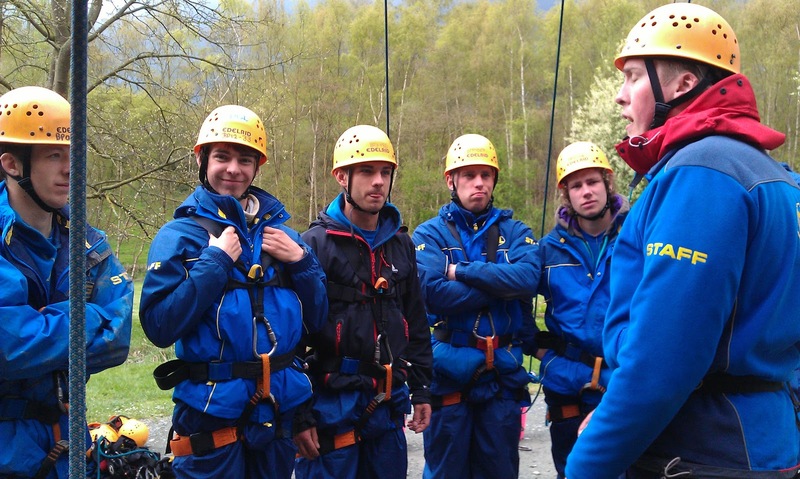 I was joined by Alex, Josh, Nick and Luke for the weekends course. After a bit of a chat, introductions to the course and a brew at Petes Eats we went up to Pont y Gromlech in the Llanberis pass to look at gear choice, group management, route choice, gear placement and rigging for bottom top roping. It was a bit chilly but dry throughout the day. We the went to the Beacon to cover indoor climbing until they closed at 7. Our camp site at Llynnau'r Cwn (640m). The weather was very kind to us on the expedition with only a few bits of cloud around yesterday but by last night the sky had cleared to give us a stunningly clear but cold evening for our night navigation exercise. What made it even better was the stars were really clear with no light pollution which I think everyone agreed was very special. We started the 2 day trip from Gelli Iago up to Cnicht (689m) and camped at Llynnau'r Cwn with a night navigation around the area and over to Ysafell Wen. After a cold night and a ground frost we made our way back to Gelli Iago via Llyn Llagi under beautiful sunny conditions. The aim of the expedition was to navigate using 1:25,000 maps, map to ground and ground to map interpretation, mico navigation, camping skills, route choice and various other aspects of the ML syllabus as and when required. We covered emergency rope work today around the base of Clogwyn y Tarw. There were quite heavy showers at times this morning but they weren't long enough to cause us any big problems and it wasn't too cold to stand around playing with ropes either. There was a dusting of some white stuff on the tops but it was probably hail which we also experience in the valley and had pretty much gone but the time we made our way back to the road at the end of the day. What a contrast from the last couple of days of pretty damp and dreary weather. We had another mountain day planned for today so that we could consolidate the skills we covered yesterday and to look at security on steep terrain within the ML syllabus. We headed into Cwm Idwal this morning with a showery and cold forecast with a plan of going up the NW Face Route onto Seniors Ridge and then to the summit of Glyder Fawr (1001m). The plan worked perfectly and the weather was very kind to us - so much so that we stayed dry all day with the odd shower of light hail on the summit. The winds were light with the freezing level just about on the summit, we even had some sun to contend with. The group were very eager to learn and were enthusiastic throughout the day so we changed the plan a bit and decided to make a descent of Y Gribin to complete a perfect day. Day two of the ML training course was a mountain day to look at route choice and leadership skills. Given the poor weather forecast I decided that it would be better to head over to the east of the park to get some shelter from the rain and the wind. We headed over to Capel Curig to start our journey up Crimpiau and then Craig Wen before making our way down towards Llyn Cowlyd and then back to Capel Curig. It seemed to work out quite well with good visibility for most of the day and light winds - it still rained though!! I'm directing an ML training course for Blue Peris Mountain Centre this week. I decided to go up Cwm Ffynnon above the Pen y Gwryd to cover navigation using a 1:25,000 map. We also looked at some environmental stuff as well as chatting about geography and geology. Jim (observing) Heidi, Seb, Lucy and Josh high above Llyn Cwmffynnon. Well, it was certainly a day of two halves in more ways than one today. I was out in the Moelwynion above Pen y Gwryd with Graham, Will and Mike this morning as they were keen to look at some micro navigation skills. The weather was very wet, cold and windy which was perfect and it certainly tested everyone's gear as well as navigational skills. We had planned to do some rock skills in the afternoon but I wasn't sure that the weather was going to be good enough but sure enough the sun came out to produce an excellent, dry afternoon over on the Pinnacles above Capel Curig. 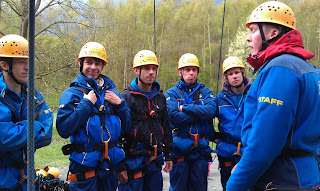 We looked at equipment choice, anchor placement, joining anchors, single pitch climbing and belaying. I was over in the Ogwen Valley today running a rock climbing session for a group from London on Tryfan Bach. The group were keen and very enthusiastic but the only problem was that the weather forecast was correct! The dampness this morning didn't cause us any problems as it wasn't enough to wet the rock but (as predicted) it was very wet after lunch and kept the rock wet all afternoon. A good time was had by all with lots of climbing and belaying taking place. It was a perfect day at Tremadog today. Mostly sunny but not too warm and not too cold. I was up on the Upper Tier of Pant Ifan today with a group from London. The crucial part and the thing that made the day such a success (apart from looking after a brilliant group!) was the lack of people. We had the place pretty much to ourselves until after lunch but we were the only group there all day. Excellent group, sun and dry rock.... perfect.